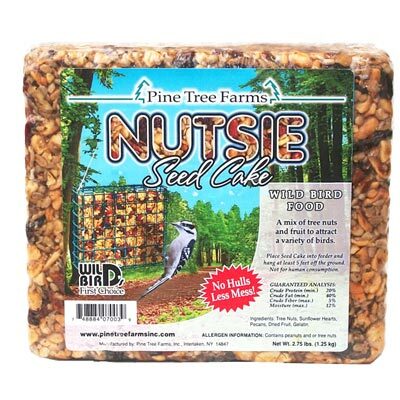 Watch your backyard birds go crazy over their favorite foods when you offer them the Pine Tree Farms Nutsie Seed Cake. This significant cake features a mixture of peanuts, sunflower hearts, tree nuts, and dried fruit, providing your feathered friends the protein and fat they need to thrive. The nuts are all hulled, minimizing waste in your yard, and gelatin helps the block maintain its form. Place this large seed cake in a Pine Tree Farms All-Season Large Hanging Wire Bird Feeder (not included), or rest it on a tray or dish for more versatility. Using formed seed cakes helps keep your garden tidy, for a fun alternative to loose seed feeding. Enjoy a bevy of birds feeding in your yard on this Nutsie Seed Cake. Made in the USA. Note: This case pack includes 8 of the Pine Tree Farms Nutsie Seed Cakes, 2.75 lbs. each.